Hey, we're getting some very cool attention from fellow bloggers! Recently, perhaps in the past three weeks or so, there has been a flurry of fun Blog Awards circulating out in the blog-o-sphere. A few of these nice awards have been bestowed upon Authentic Blogger to recognize our efforts at creating a welcoming, friendly community for all things bloggish. These Blog Awards usually come equipped with a "pay if forward" list of instructions, requesting that the recipient list their Top 5-10 favorite blogs along with the reasons these are their favorites, and then go on to list a Top 10 list of some interesting personal content. 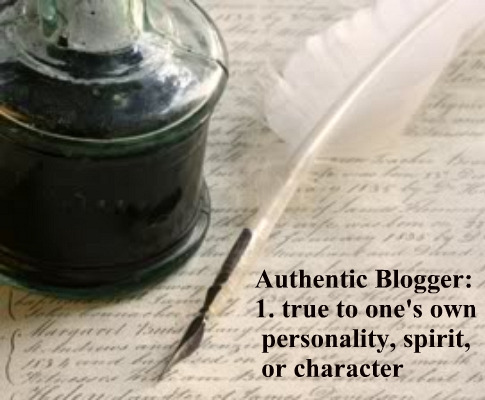 Marty and I are very appreciative and flattered that Authentic Blogger and our sister blog here, The Authentic Blogger are both garnering attention in the blogging world. We do feel, however, that as Authentic Blogger exists to support all bloggers, it wouldn't be fair, or professionally correct for us to single out our Top 10 favorite blogs. Heck, come to think of it, that would be an exercise in torture, because we have hundreds of AB authors in our community - it would be impossible to narrow a list down to a Top 10. So, here's what we've decided to do: we're going to offer a heartfelt Thank You to everyone who very kindly gave us a nod of recognition with these fun awards. We are then going to embrace the latter of the instructions above and throw out our own fun list of "stuff". Since there are two of us, it's going to be a respective Top 5. Keep reading to see what each of us come up with, because they may be on completely opposite ends of the spectrum! 1. I am an Olympics fanatic, it is true. Those who know me well are quite aware of this trait. The Winter Olympics begin on February 12th and last for two weeks. During these two weeks, everyone knows to not invite me to dinner, or call me on the phone in the evenings - I will be occupied watching the Olympics each night. Yes, I'm serious. I'm more patriotic than most, and the Olympics are a special, bright moment for the world. Expect to see an upcoming blog on this topic, no joke! 2. I have an absolute horror of certain non-words and firmly believe that when written or uttered aloud, the person perpetrating this horror and the ones they're communicating with cease to exist for a nanosecond. It forms a Black Void. 3. Similarly, I believe there is some truth to the belief that our car keys, socks in the laundry, cell phones, etc., disappear randomly because there are troops of Elfs that live in our homes. Think about it, peeps, it makes sense! Where DO those missing socks go, and who took them, if not the Sock Elfs? Car Key and Cell Phone Elfs are merely a sub-union - same local Union Hall. 4. Paging through seed catalogs in preparation for spring container planting on my apartment patio is a simple joy. Tomatoes of several varieties, cucumbers and possibly some small melons are on my list this year. 5. It bugs my artistic eye when people wear two shades of black that clash. Yes, it is possible for black to exist in differing shades. Good example was a friend at lunch the other day (whom shall remain nameless) who was wearing a pair of black slacks that had an underlying purple tint to the black, while their sweater was a shade of black w/ green undertones. Of course, I've walked out of the house wearing socks of two different shades - like green and dark brown (not a morning person, so it happens) - so who am I to criticize?! 1. Haha. This is going to be fun. Some of the things I won't write on my personal blog, I'll write here. Why? Because my family isn't reading. 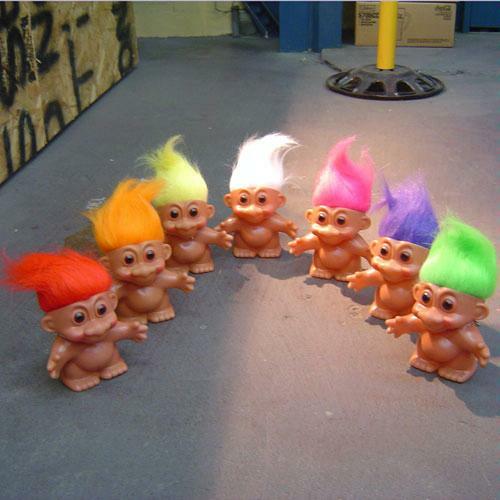 I collect trolls. You know the ones with the long, different colors of hair that are buck-naked? They still make me smile, they are so happy to go commando. 2. I am entirely hopelessly lost without my phone. I use it for my alarm clock, email, FB, Twitter, GPS, Blogging on the go, Throttlecopter game, Bible, Dictionary... well, you name it, I have it. Check it out here! And yes, I have this stand for beside my bed. 3. I dislike Walmart. I only use it when I'm depressed about myself and my situation. I go there and look at the flustergasted parents with screaming kids, the couples that are trying to decide which cheap, flat bed pillows to buy, or the poor people buying that fall-apart furniture. I immediately feel better about my life. 5. I can hardly ever remember which cables go where when jump-starting a car. I'm so embarrassed to admit this, but at one point, I googled it.... on my phone. Fun, fun, fun thanks for sharing you guys. Who would have guessed some of the things you revealed...=D I love getting to know people better, thanks for all you do. Glad you enjoyed our spin on it, Bill! Thanks for the nod towards AB endeavors as well. We love what we do!